It depended wea you was but Tropical Storm/Depression Flossie either packed a punch or hit like a girl. Ok, maybe not like a girl cause some wahines actually have some knockout power but sadly, like a fight, there are always two sides of da tape to tell da tale. Being indoors for 90% of da weather phenomenon, I couldn't tell whether it was bad or not. I work in a basement wit no windows so I couldn't visually see da weather changing and wen I got a chance to go upstairs it was actually.... sunny. At pau hana time it was barely drizzling and I was wondering if Flossie had totally broken up. Wen I got home, it still wasn't raining and in fact, I got more wet driving into work than I did going home. Once inside da hale, we were watching da news and all da havoc Flossie could muster and it looked bad but I kept wondering wen it was going to hit "us". I gotta admit, da news coverage and social media surah went nuts! It was like information overload wea as before we couldn't get enough information. I was glad dat da tv media was actually letting NOAA do their job and let them report da status of Flossie instead of da "news" making a story out of it. It was amazaing to get info straight from da horse's mouth. All through da late afternoon into evening into late night, there wasn't a single indication dat a tropical watevah was rolling though - at least wea I live in Pearl City. It's not dat I'm extremely grateful it didn't affect us compared to wat we've seen on da news, but it's like waiting to yell "Surprise!" - you wait and wait and wait and if by chance it doesn't happen, you're like a deflating balloon. I guess dis was a rare "good" WWD! for us personally. Were you prepared for Tropical Storm/Depression Flossie? Do you have a survival kit? We all knew about the weather approaching - did you get your provisions early, da day before or dat day? Are you only worried about hurricanes? Wat did you tink about da actions of da State? It's like they say, it gets bettah every time and it's nice to see dat da "professionals" are improving. As you may already have assumed by my Korean background, I enjoy spicy grinds - or at least spicy condiments - so it's not often - rare in fact - dat da BL household was out of one. I tink das all I could see and remembah. Dis past Sunday Da Wife was in da mood for pizza so of course gotta oblige right? But wat's pizza without hot sauce? Aftah grabbing a slice, I look for da sriracha. A'ole. BL: "Babe, wea's da sriracha?" DA WIFE: "Did you look in the fridge?" DA WIFE: "Did you look in the pantry?" BL: "No more. I thought we had anoddah bottle." DA WIFE: "If it's not in the fridge and it's not in the pantry, then we must be out huh? We just have to pick up the next time we're at Sam's." BL: "So wat I going eat da pizza with?!?" Trust me, pizza is not da same without hot sauce. Strike dat. 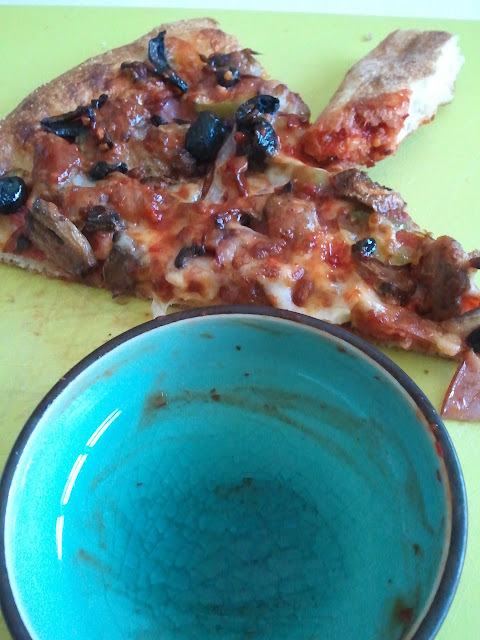 Pizza is not da same without sriracha. I tried oddahs: chili peppahs, tabasco, jalepeno and even jalepeno juice but it's just not da same. You read right. Da WORLD'S HOTTEST PEPPER! I completely fo'got I had dat bottle. A friend of mine had given it to me late last year wen she came back home from Seattle and I'll admit it........ I was afraid of it. 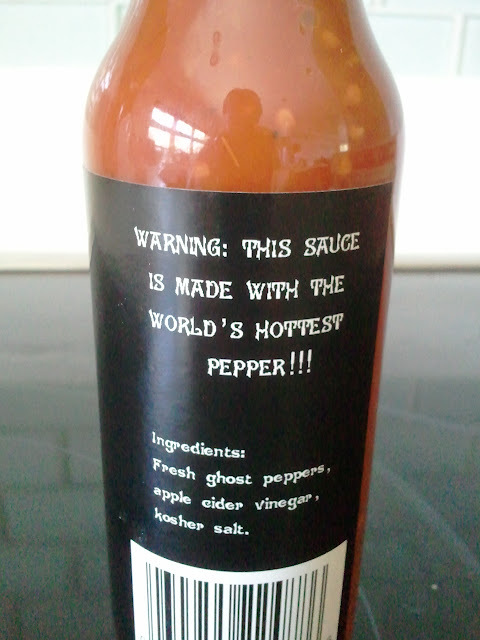 Well, wen da words "World's Hottest Pepper" is on da label, it makes one tink about ingesting it and eventually having a FITH (Fire In The Hole). Maybe calling 911. 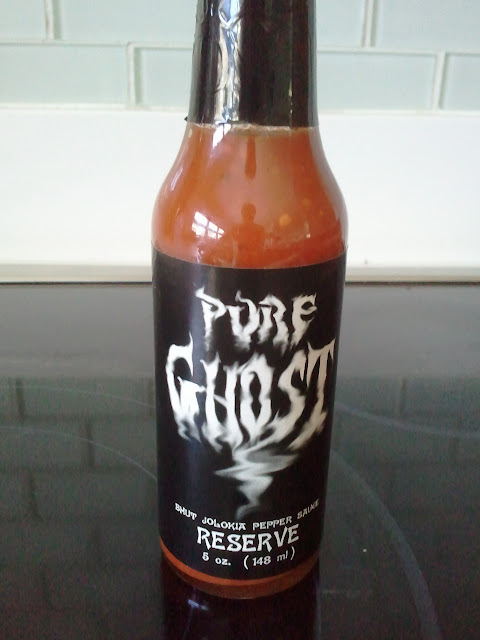 I had an opportunity about eight years ago on a trip wit Da Wife - who was Da Girlfriend at da time - and there was a full grown Ghost Pepper on my jambalaya dat da server said was for "decoration only" and to not eat it. I was tinking "just decoration? WWD!" all da while Da Girlfriend was chiming in saying "don't even think about it." Well, I took a very very manini bite da size of a chili peppah flake and da buggah was HOT! You can't really see it but my cheeks were flushed and I was sweating like it was 102 degrees outside. You could literally get a sunburn from me if you stood too close. I'm surprised da lens on my camera phone didn't fog up. Can you handle spicy foods? Or is tabasco your hottest? Wat's da hottest thing you evah ate? Do have to spice things up wen you eat? Just noticed dat all da "hot sauces" has vineagar - how come? Have you evah had a FITH? Have you evah done a "spicy" challenge? At a meeting yesterday, our new supervisor was asking questions to familarize herself wit our department process and as we were giving explanations, I found my self talking alphabet soup. "In ****, you'll have PO's with *, ***, *, * while you'll also have *, *, **, ***, ** and *, not to mention there are frequent *, ** and **'s to deal with but in *** you won't have any of those as we'll deal with ***'s and other voucher's." It threw a movie scene flashback from "Renaissance Man" wea Danny DeVito was asking driving directions from a Marine on base and was thrown every acronymn at him. Anybody remembah dat? We now live in a world of acronyms and it is now no longah reserved for technical terms or special situations as it is now commonplace dat it's used in everyday langugage! Wat gets me is dat people no longah even say wat they mean any more as they just say da acronym in place of it. In fact you're probably from a different planet if you don't use 'em - or understand 'em - in texting or any social media out there. If you can only read Tongan, Samoan, Tagalog, Mandarin, Korean, Vietnamese, Japanese, and Spanish, you're in luck when it comes to taking your Hawai'i state written driver's test by da end of da year. There will be a nevah ending debate ovah why it is/should be offered - and those left out - in oddah languages but I just wanna know, why and how come not just in Engrish? First, if you stay "illegal", how da heck would you be allowed to obtain an official state document (license) - yes, it is property of da state - in da first place if you not even "allowed" to be in any of da 50 states? If you are able to work hea legally (found out dat immigrants from Micronesian nations are part of the Compact of Free Association, which means dat they are permitted to legally travel to, and live and work in, the United States), I can actually understand why da written test should be available in oddah languages because of dat.... but why not all of 'em 'den? I was just tinking about dis whole "oddah language" thing down da road, pun intended. Wat about da drivah's test 'den? Going get one translator administering da road test or going get one translator in da back seat? So wat now - HPD gotta explain da ticket/infraction in oddah languages or call in one translator? If not, 'den will da ticket be "written" in oddah languages as well? Wat about reporting an accident to 911, are they exempt from reporting/calling it in cause no one can understand or do they press 4 for Samoan, 5 for Tagalog etc.? Wat about da road signs since dat is a good chunk of da written test? How you going fit 8 languages on those buggahs? Ok, while da "basic" ones no need, wat about da State's "electronic billboard"? If they no can read da emergency/heads up messages dat come across those, isn't dat a requirement to be able to understand all posted signs? 'Den there are those oddah traffic LED signs dat are just left on da side of da road warning of impending/future traffic concerns. Da biggest point of emphasis, from wat I've read, of why those who can't read Engrish needing da written test in oddah languages is about necessity of obtaining a job, healthcare and basically transportation - 'den why not learn da language? Wouldn't you tink if it's "survival", you would do anything/everything you could to fill your need? My parents are transplants from Korea (South side of course) and my brother and I are 1st generation hea in da islands so I've lived/living a dual "foreign" life. Growing up, we've had da nevah ending debate of me learning Korean and my parents learning Engrish. While I cannot read it, I can speak Korean conversationally but if I had to live there I would definitely learn to read it. I'm proud of my mom for naturalizing and obtaining her citizenship all da while taking English classes out of necessity and... survival. She took pride in learning her new "right". Personally, contrary to watevah law, federal act watevah is out there, if you're to benefit in dis great nation, you should at da very minimum of decency, learn da language of it. We are probably one of da very few to be fortunate enough to carry on such a diverse melting pot but if you stay living hea, learn - and respect - wea you live. 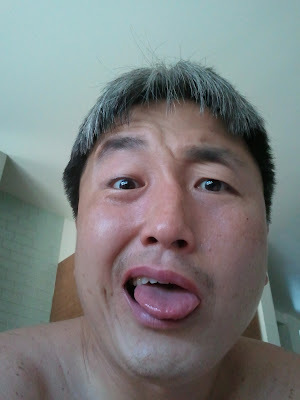 In a similar tangent, jus' like how haoles, asians and watevah kine come to live in da wonderful 808 dat already understand/speak Engrish, you begin to learn Hawaiian and Pidgin and our unique mix of culture not only to assimilate but to survive as we are a state to share dat (any) Aloha . Those who no like "learn", are da ones who end up disliking da islands and leaving. I can't say enough for da ohana support dat Da Wife and I have in helping to raise Da Baby. Every time there's a situation - like wen she goes through febrile seizures - it's just a relief to know dat someone has our back in any way, shape and form. We count our blessings everyday dat we have support from many hands to help shape and mold Da Baby into wat we believe she should be and how life should be lived. Every time something comes up and we gain anoddah experience from it, we can't help but be extremely grateful for those times we have da ohana support as we constantly wondah how da heck single parents - or two parents but only one does da actual work - manage da extreme responsibility of raising a child. I can't even begin to fathom how one does it by themselves as there are many a time dat frustration would boil ovah. So to all you single parents out there, I tip my hat and bow to your strength in staying steadfast. Da Baby is no longah Da Baby as she will turn three in September, so I guess she's graduated to Da Keiki and will have to pass on da title to her little baby braddah. 10 fingers, 10 toes and as healthy as can be - aftah some complications da first week - but I just hope da WWD! gene hasn't passed on to him. Sleepless nights have begun as diapers fill up the trash but Da Keiki has been a terrific big sis so far singing to him and helping watch ovah him. E Komo Mai to da WWD! world............. got any tips or mo'olelo's to share da second time around?